Today I have three anniversary cards I made when I needed a bit of no thinking craft time last night. I grabbed a paper pack that came with a magazine quite some time ago and decided to make some cut and stick cards. I started by cutting the background papers into 5.25 x 5.25 squares and mounting them on some kraft cardstock I had rescued from an old scrapbook I was getting rid of. Then I mounted the inages on the same cardstock and then used the left over bits for the strips in the background. I then added a few embellishments from the stash to finish them off. The first one uses some heart satin trim I got in a swap … nice to find a use for it. 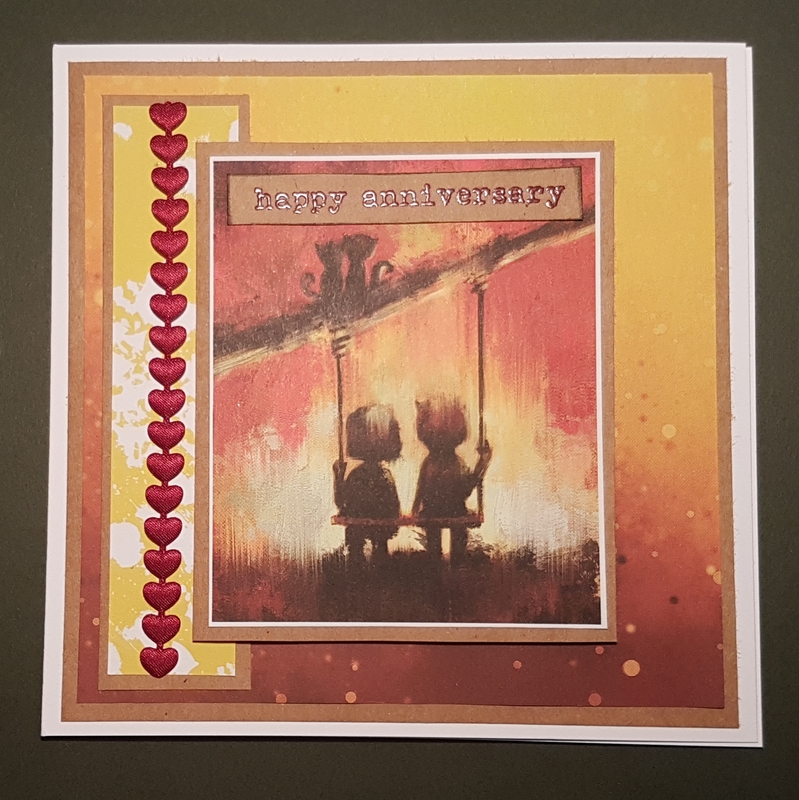 I used the same stamped sentiment from the Paperartsy Emma Godfrey set for all and heat embossed in a rich burgundy colour. The next uses a similar satin trim. I also used a Scrapinec laser cut chipboard embellishment I found in the stash. I added wink of Stella to it to give it some shine. 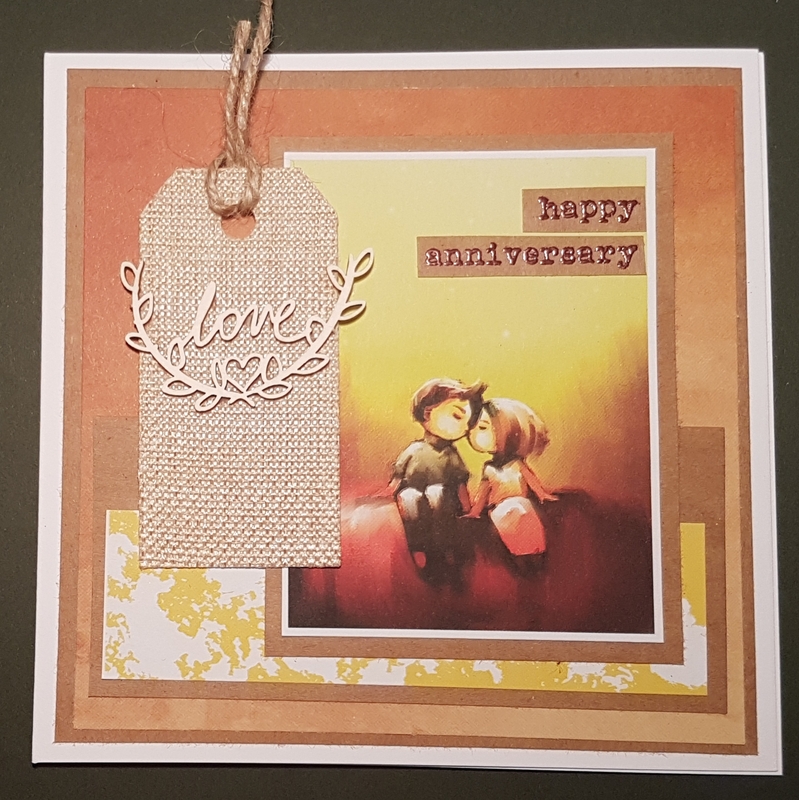 The final one has another Scrapinec laser cut chipboard embellishment and a Hessian tag which was in an Artful Days Goodie box a while ago. Love how simple these were to pull together. Exactly what my frazzled brain needed. I’ve still got a few of the images and some of the background papers left so think I may still have some more cards to make from this… and it was only half of the pack as the other half has different designs… ah well maybe another day!